If your device, your carrier, and your data plan allows it, you can turn your mobile phone into a Wi-Fi hotspot to get your laptop online. But just because it’s a hotspot doesn’t mean the rules of data uses don’t apply. You’ll still want to keep data usage down to a minimum. 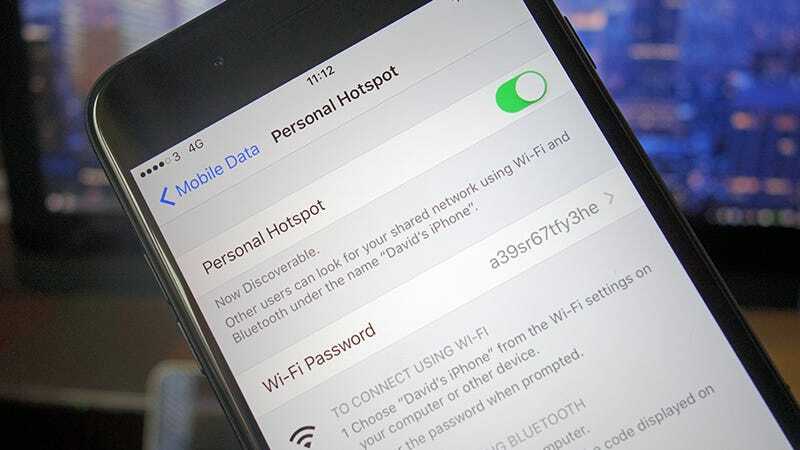 Here’s how you can enjoy all the perks of a mobile hotspot without wrecking your wallet. Chrome has a Data Saver extension made by Google that cuts down on page loading times by rerouting the sites you visit through Google’s servers, and compressing them along the way. If you trust Google with this kind of data (HTTPS pages and pages launched in incognito mode aren’t included) then it’s a quick and simple data saving trick. This add-on gives you the same feature in Firefox, though it’s an unofficial implementation of Google’s Chrome extension and isn’t made by Google itself. Alternatively you might want to install Opera instead, it has this kind of functionality built in (look for the Opera Turbo option)—again only non-HTTPS sites are processed, so your most sensitive data isn’t intercepted. Meanwhile, turning off the automatic loading of images makes your browsing experience a lot less interesting, but it’s going to save you a whole heap of data too. In Chrome’s Settings pane, go to Show advanced settings then Content settings to disable automatic image loading; in Firefox, the same option is on the about:config page—change the permissions.default.image value to 2. Alternatively, get a browser extension to do the job for you. We’ve talked in the past about stopping videos from auto-playing, and this advice still applies if you’re wanting to save data on a tethered connection, though many sites will adapt their output accordingly if they detect you’re on a limited connection. As far as applications outside your browser, the best way of saving data while tethering is to cache all your music and movies on your laptop beforehand, while you’re still attached to some solid wi-fi. If that’s not an option though, you can still make changes while you’re out and about. Netflix should adjust your streaming speed automatically to match your connection, but setting this manually will lower quality and data sucked down. Choose Your Account from the menu under your avatar, then click Playback settings and select Low. In the settings page for the Spotify desktop client, meanwhile, you’ll see a High quality streaming toggle switch, so make sure this is off while tethering. We can’t cover every application you might have installed but if you poke around in the settings for your programs you might be able to find similar options. It’s also a good idea to hit the pause button on syncing services like Dropbox and Google Drive if it’s practical to do so (you can do this from the system tray or menu bar icons). You also want to put automatic downloads and app installations on hold while you’re tethering, and there are changes you can make at the OS level too. Launch the Settings app in Windows 10, click WiFi then your network, and you can toggle the Metered connection switch: this tells installed apps you’re on a limited connection, and puts a halt to large OS updates at the same time. There’s no such option on macOS, but there is TripMode, which works on Mac and Windows computers. The app lets you set which programs can use data and which can’t, so you get much finer control over how much data is getting pulled over your tethered connection, and you can get detailed usage breakdowns as well. TripMode costs $7.99 but there is a free trial available. Beyond these tricks the most important thing to do is apply some common sense when it comes to the apps you’re using and how you use them (keep those browser tabs down to a minimum), but the tips above should get you well on your way to saving a ton of data while you’re tethered. As an added bonus, you should save some battery life too.